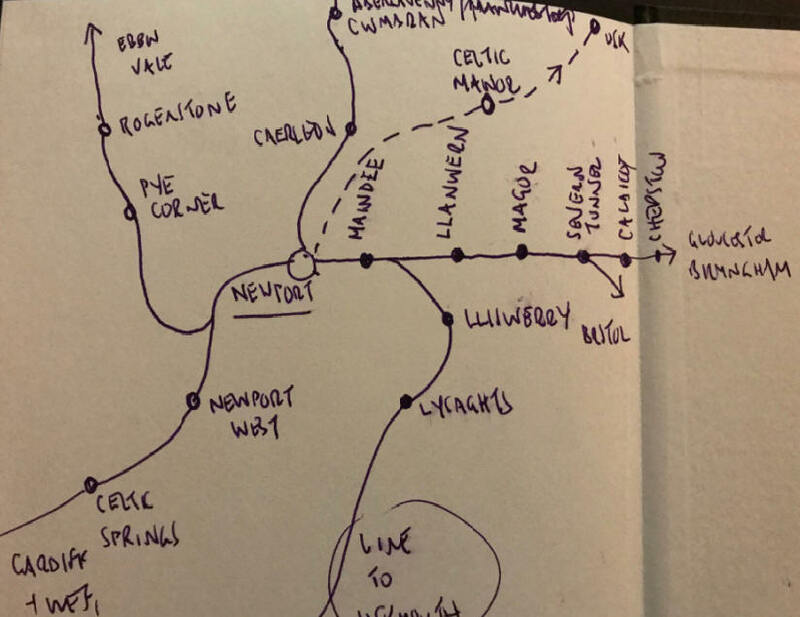 Ok so it looks it a bit of a rough sketch but the outline below would give Newport a proper place in the South Wales Metro utilising existing infrastructure for heavy rail stations including the Uskmouth line south of the City. The Map envisages the expansion of services on the proposed slow relief line commuter line between Chepstow and Newport to include new stations at Magor and Maindee as well as the proposed new station at Llanwern. A new station at Caerleon is part of the Metro proposal but we also propose new stations at Newport West (near to the Tesco Extra store) and near to Celtic Springs at Coedkernew. In addition, new stations could utilise the single track freight line allowing new stations at Lliswerry and at Lysaghts / Orb area serving new and old areas of significant population. The track here would require a turning facility. A new service could serve the two new stations, Maindee, the main Newport station and then the new local stations to Cardiff including the proposed St Mellons Parkway facility, Newport West and Celtic Springs. This would open up commuting and leisure opportunities of real significance and cover an area of significant road congestion from the east of Newport to junction 28 and on into the centre of Cardiff. The proposal would include the return of dedicated hourly Ebbw Vale to Newport services reconnecting Rogerstone and Pye Corner back to their home city. In addition, a new Bus Rapid Transit service would run from Friars Walk to Newport Station serving the Celtic Manor, the Coldra area, Usk, Raglan, Mitchel Troy and Monmouth as part of a dedicated frequent service along the A449 and A40. Special stations would be built in the Monmouthshire towns and at Celtic Manor with the double length bus utilising the B4237 initially on its way into Newport before using a dedicated bus lane on the old M4 on completion of the M4 Relief Road. So not just a Cardiff Metro but a solution for Wales' most congested city!